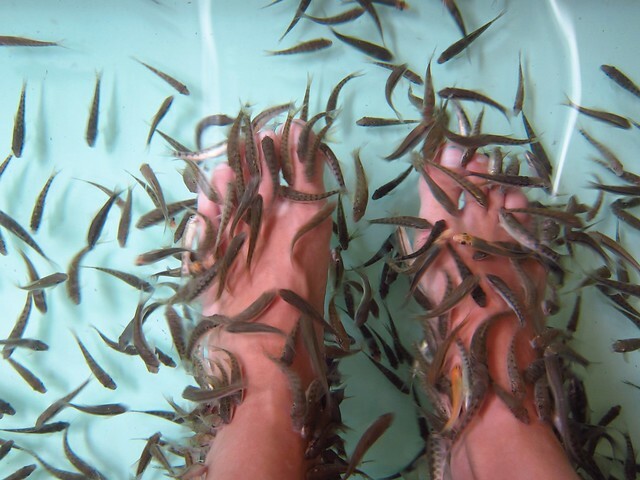 It's simple: you put your feet in a tank full of fish that nibble on dead skin. Dozens of the little guys attack your feet and ankles, feeding off tiny particles of dead skin. Fifteen minutes later, you pull your feet out, and they are softer and smoother than they've been in a long time. Plus, the fish are full and happy, so it's a win-win! Now, it's not exactly for the squeamish, as it is incredibly ticklish at the beginning! But once you get used to it, it's just kind of funny. Plus, it was the perfect break from getting soaked during the Songkran celebrations. Claud- that’s the uncontrollable and contagious laugh I miss so much. Glad you got to have this experience. Let’s get a non-fish pedicure and you can recount this experience to me and we can both laugh when you get home!